by admin | September 22, 2011 | Misc. 7Cs Edinburgh was a self catering accommodation in Edinburgh. It was located on Newcraighall Road near Musselburgh which is a 15 minute bus ride away from the Edinburgh city centre. The business owner came to us in the Spring of 2011 with a new business offering affordable lodgings for tourists in Edinburgh, which she planned to open by Summer in time for Edinburgh’s Fringe Festival. She knew that in order to get bookings she needed an online presence. Unfortunately her budget was very limited so we had to work around how to give her the most value for her money. Since the website was for the accommodation industry, the goal of the site was to make her phone ring and generate email enquiries for online bookings. So we made sure the website included the relevant pages such as an image gallery, a contact form and immediate access to a phone number for immediate bookings. We designed a logo for 7C’s using the owner’s vision of a fish leaping out of a rising wave, which represents the seven seas. We then based the web design and colour scheme on this logo. Images are the heart and soul of an accommodation website and can help build confidence in the accommodation and increase bookings, therefore the image gallery was designed to help to capture the visitors attention. Having a ‘book here’ or ‘online enquiry’ button up toward the top right hand corner of a homepage above the fold has been known to increase hotels’ online revenues. Therefore the webpage was created with certain conversion goals in mind. We made the call to action button above the page so it was not too overwhelming in the design. Also, several call to action triggers are located throughout the homepage such as an online enquiry form, contact details and a contact-us page. The enquiries through the forms are then delivered directly to her private email. 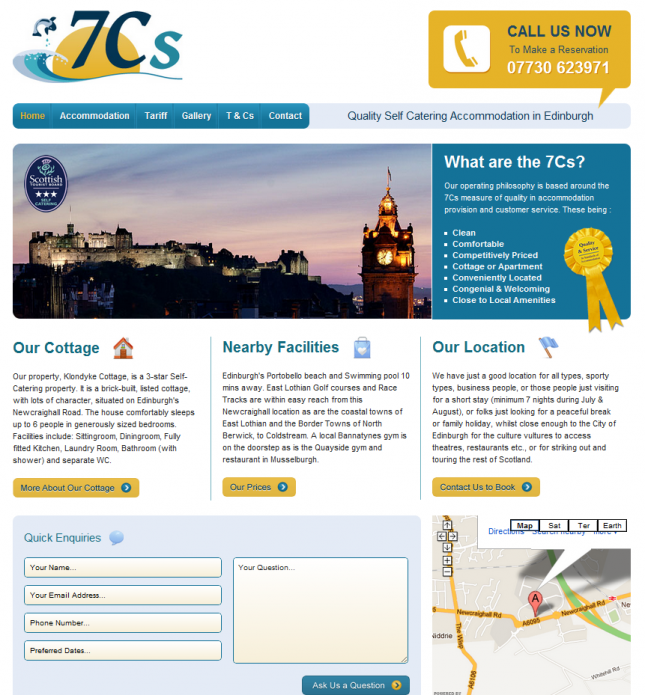 The owner of 7Cs Edinburgh was not tech savvy and she was pleased that we delivered a great website for her new business.